White fur coat | Cosa Mi Metto??? This is the outfit I chose yesterday for a brunch, I think it's comfortable and stylish and I couldn't wait to wear my new Chanel (that I have already shown you here and worn in this post). Like it? Questo è l'outfit che ho scelto ieri per un brunch, lo trovo comodo e elegante e non vedevo l'ora di indossare la mia nuova Chanel (che vi ho già mostrato qui e indossato in questo post).Vi piace? wow che gnocca!! ma stai da favola!!!! You look elegant and beautiful as always! Questo outfit è a dir poco meraviglioso!!! Brava! Great outfit! I love the bag! Non passavo dal tuo blog da un pò :) ma lo trovo ancora più bello e professionale! brava fabrizia! I love your outfit and your Chanel! the white fur coat is so stunning! I like ur fur coat n bracelet a lot!!!! I love your necklace and your ring! Beautiful! That belt always tops the outfit ! You look adorable ! 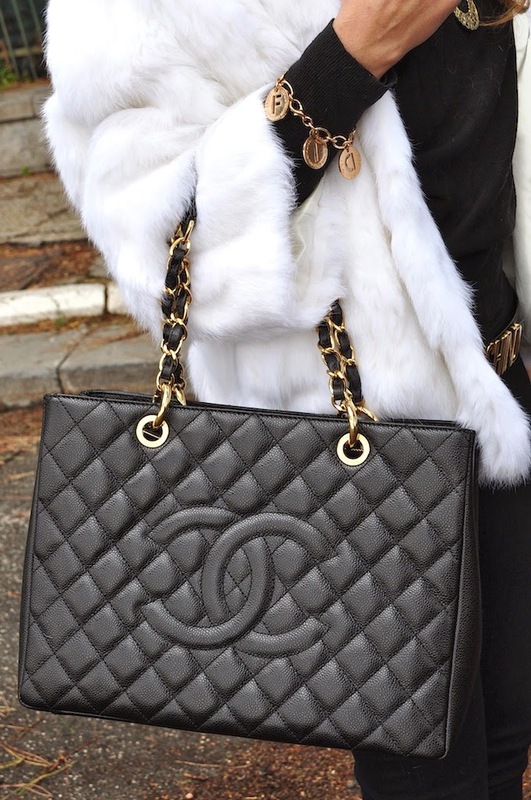 Love the Chanel and the white fur! Bellissime scarpe e bellissima la cintura (la mia è uguale..vintage!)! Un must! Molto bello questo look, adoro in particolare il cappotto e la borsa! Lovely.... Im love with your NEW bag! Pop on over to Little Miss Mama if you'd like. I promise Tea I always served with a side of Fashion AND the cupcakes have a perfect Cake to Icing ratio. I love your shoes, belt and necklace!!! pretty little things! The black and white makes it all work. I love this outfit....Just stunning! you look so pretty, and you look great in white! Thank you, I'm glad you appreciate my outfit!!! Grazie, sono felice che vi piaccia il mio outfit!!! Mi piacciono molti i tuoi outfit!! Ovviamente meravigliose le borse! Passa da me quando vuoi!